Wood, the original heat source. For centuries, wood burning fireplaces were our primary source of home heating heating. a major improvement was made with the Rumford fireplace in the 1790’s, named after the inventor, Sir Benjamin Thompson, known as Count Rumford. He also invented the cast iron stove, known as the Rumford Stove, which competed with the Franklin Stove, named after the inventor, Benjamin Franklin. This was the first wood burning stove to use a baffle system to enhance performance.these were often installed as Wood Fireplace Inserts to improve heating performance & efficiency. With the advent of central heating, fireplaces became strictly decorative and extremely inefficient, and in fact a major source of heat loss. Today, there is a growing trend to upgrading inefficient fireplaces, by installing high efficiency wood inserts. 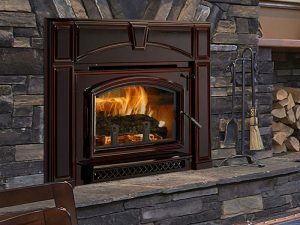 Like modern wood stoves, wood fireplace inserts have evolved over this time, incorporating technologies that make them incredibly efficient and clean burning, These technologies mean that wood fireplace inserts are extremely efficient and clean burning, providing more heat and longer burn times on a load of wood. Super heated air-wash systems keep the glass doors clean, so can enjoy the mesmerizing ambiance of the flickering flame. Wood fireplace inserts come in many styles, from a basic functional wood insert, to enameled cast iron units that enhance the decor of your home. Installation of a wood fireplace insert can be easily done in most existing masonry fireplaces. A chimney liner is installed and connected directly to the wood insert, eliminating drafts and heat loss, as well as enhancing performance. Wood fireplace inserts are an easy upgrade to your existing fireplace with a great combination of beauty and high efficiency wood heat for your home. When looking to buy a wood insert, a visit to one of our fireplace & wood stove showrooms in Ottawa or Carleton place can be a great place to start! We have a wide variety of wood burning inserts on display, so you can see how they look and operate, before you buy. Our experts will help you choose the wood insert that best fits the form, function and budget you are looking for. Easy monthly payments are available, and with easy online pre-approval, you can shop with confidence. Installation of wood burning inserts, in Ottawa and surrounding area, does require a building permit and inspection from the municipality, but no need to worry. Our experts will provide all that is needed, and ensure that the process is easy and seamless from start to finish. When the installation of your new wood fireplace insert is complete, we provide a WETT certificate, which certifies that all aspects of the Wood Insert installation meets all codes and regulations. Call or visit one of our showrooms today! Compact wood fireplace insert, built for clean, durable performance. The Voyageur Grand wood insert is a larger version of the award-winning Voyageur. See it in Our Ottawa or Carleton Place Showrooms! The Voyageur Cast Iron Wood Insert features a flush front with elegant lines and a large, unobstructed viewing area. All the features of the cast iron T5 insert—plus the added beauty and charm of lustrous porcelain enamel. Transforms an energy-wasting fireplace into a cost-saving source of heat, without sacrificing the comfort and appeal of the home fire. For heating large spaces with a masonry or factory-built fireplace insert, the Summit Insert is the solution. Side air damper rod stays cool to the touch – Single, easy-to-use draft control to easily regulate fire – Ultra strong air wash to keep glass clean – Dual action door latch is laser cut and chrome plated with a wooden handle. Single, easy-to-use draft control to easily regulate fire. Ultra strong air wash to keep glass clean. Available with Several Door Options – Ultra strong air wash to keep glass clean. Ceramic top baffle. Cast iron top and door for a modern, clean appearance. Twin pilot-injector ports for easy start up.